Today we’re heading for East London. Home to Jack the Ripper, East Enders (real and fictional) and the London Olympics. And now to The Hungry Donkey. There’s a lot going on in the East End. The menu at this contemporary little Greek restaurant is inspired by Greek street food with the emphasis on simple dishes made using the best ingredients. Reading the menu transported me back to a sunny island somewhere. Well, almost. It was a particularly grey day and drizzly day in London Town which made me yearn for the sparkling blues and whites that only Greece captures so perfectly. At least I could tuck into some sunny food. Dips are an integral part of Greek cuisine and I love them. 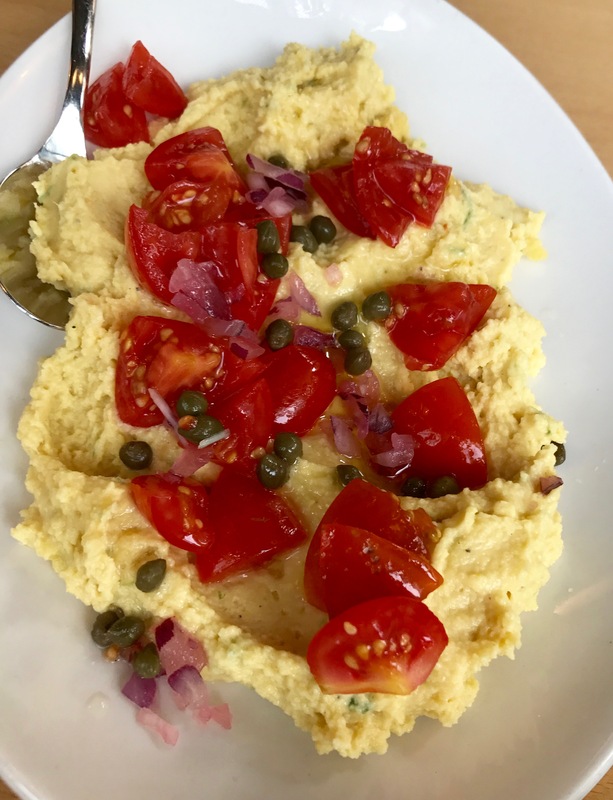 This colourful plate of fava – yellow split pea puree was served topped with vibrant, juicy tomatoes, finely chopped onions and crunchy, salty capers. And I can never resist the salty fishiness of a tasty taramas (as it was called on this menu) – made from cod roe and lemon juice. 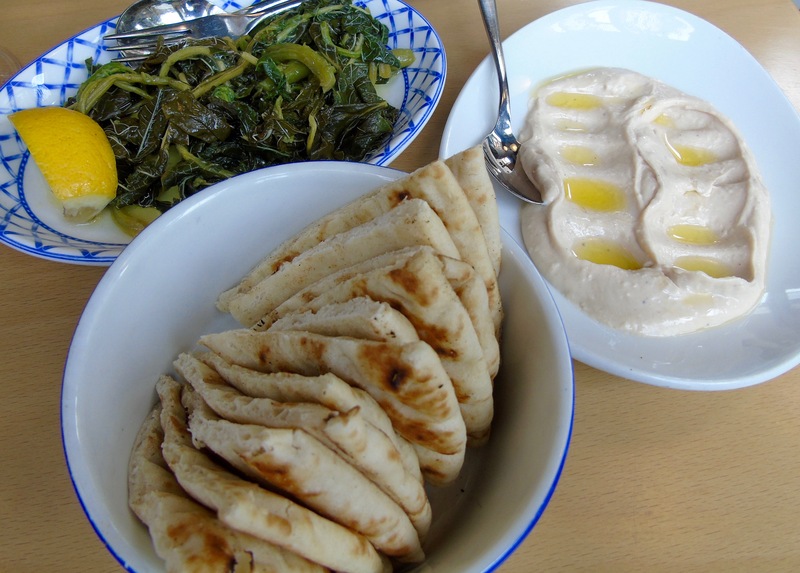 Served with the most perfectly soft, warm pitta bread for satisfying dipping. 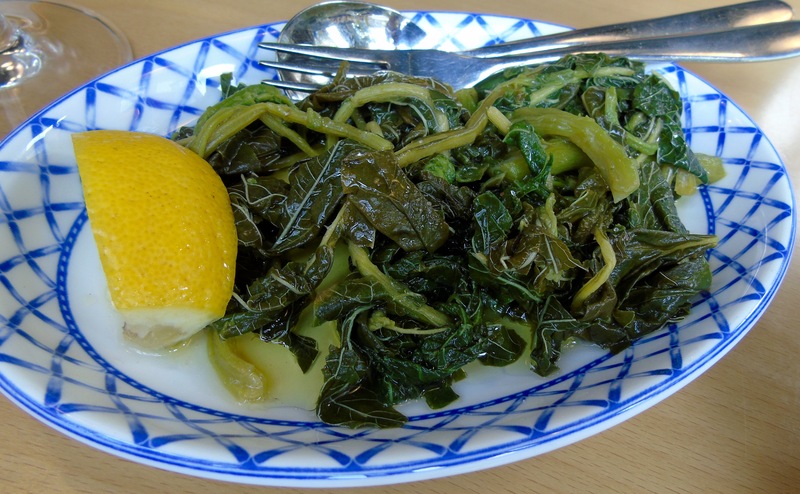 The greens in the blue dish – we could enjoy some of Greece’s blueness with their azure decorated crockery – were served fried and dressed with olive oil and lemon juice. Also in the Mezedes and Salads section, the Greek sausage is a mix of wild boar, pork and leek. 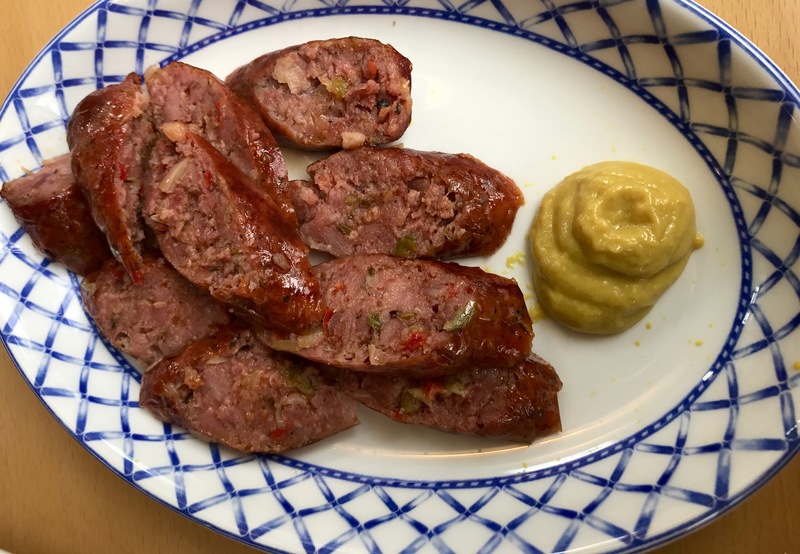 Delightfully meaty and herby, served simply fried with a dollop of mustard. 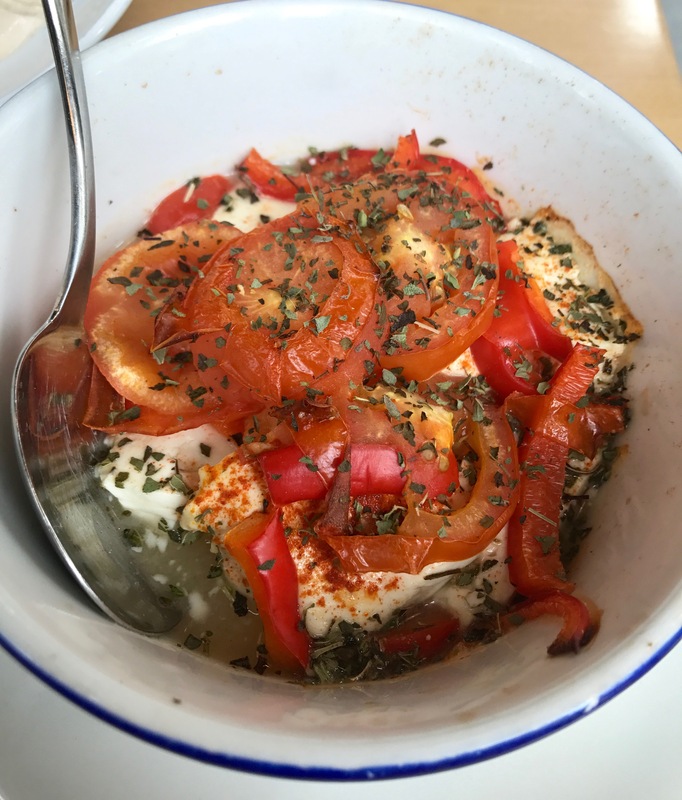 Feta is another Greek staple and here the feta bougiourdi is oven baked with tomatoes and paprika and topped with oregano. A great mix of Greek flavours with the saltiness of the cheese combining perfectly with the sweetness of the tomatoes and the earthiness of the oregano. As well as the smaller plates, the menu also offers full main-course portions. 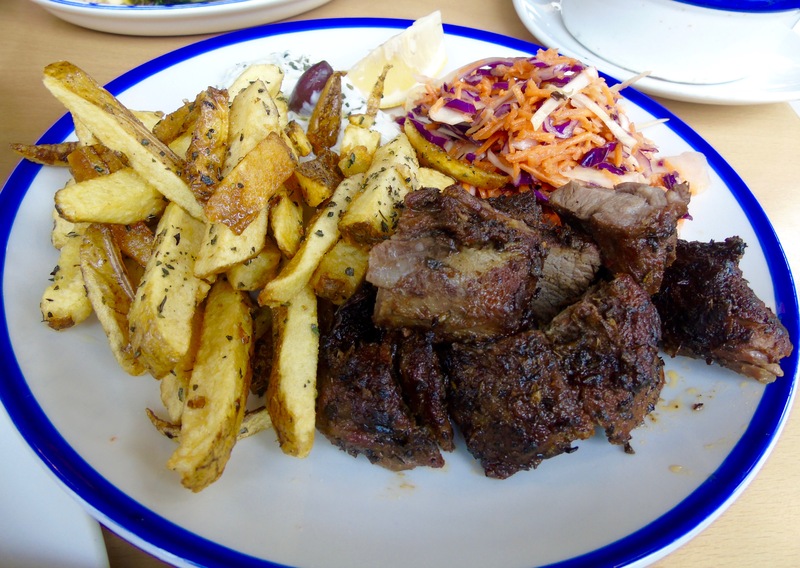 In the Plate Me Up section there’s a choice of meat (lamb, chicken or pork) served with handcut chips, salad and tzatziki. I’ve sampled many a grilled skewer (souvlaki) both in Greece and outside and today’s lamb ones were up there with the best. Beautifully flavoured by the marinade and cooked to amazing tenderness. Served with crisp, piping hot chips and traditional yogurt dip, this is a wonderful plate of Greekness. Just looking at that lamb makes my mouth water. The menu also offered a section titled “Traditional Greek dishes just like Mama used to make” which includes classics like moussaka and beef stifado. But we’d already had quite a feast! Even dessert seemed a step too far until George offered us takeaways to enjoy later. I’m so pleased he did as the semolina, custard filo pie with cinnamon is now one of my favourite desserts. The restaurant also prides itself on its all-Greek wine and spirits menu. I haven’t drunk much Greek wine but have always been impressed on the occasions I have. Today we enjoyed a lovely white – Spiropoulos – Mischofilero – Mantina. The Hungry Donkey is a welcoming Greek oasis in the burgeoning Aldgate area where new complexes seem to be springing up on every corner. Lovely service, tasty food and great value – and a chance to feel like you’ve had a little Greek mini-break. Well, it will have to do me until I can head to those sunny isles again. Lunch for two cost £55 for three courses. The Hungry Donkey is at 56 Wentworth Street, London E1 7AL.